I do a fair amount of dealer prep, and even took a class on it at the last PTG National Convention. The first level is dealing with what Don Mannino called “PMS”: Post Move Syndrome. This is correcting issues that weren’t present at the factory, but caused during shipment. It’s a lot like cleaning up cars after they’ve crossed the country on open trailers. The second level is refinement: taking the time to improve the piano from where the factory left it. Some pianos spend months in transit by ship, with huge diesel engines that create a lot of vibration. For grands on their side, this means the hammers are being forced sideways against the flanges repeatedly, and the dampers are moved back and forth across the strings. Most manufacturers tie down the action to minimize this stress, but it’s still there. Don told us how to eyeball to make sure the hammer shanks are all directly over the wippens. Sometimes the action needs to be shimmed at the bass cleat to make an overall alignment correction. The next impact is environmental acclimatizing. Pianos from overseas typically arrive today in an airtight bag inside a crate. The first day after opening them here in New Mexico, they sound fine. Within two or three days, usually there’s a big adjustment starting (our relative humidity indoors hovers around 25%-35% year-round). 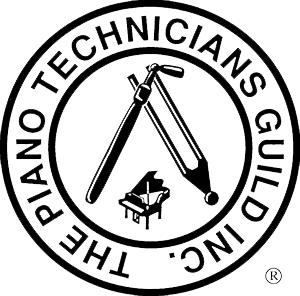 This means keyslips can warp, binding white keys at the front; hammer shanks can twist, causing alignment problems; key sticks can expand, binding on the pins; keyframes can change, throwing off key dip, requiring re-bedding; and everyone’s favorite, a variety of damper seating problems (binding at the guide rail, twisted heads, etc.). Customers have an unerring ability to walk up to a new piano, and at first touch, play the one note with a damper issue! The improvement phase is an extension of the work already done at the factory, as a final quality control step. I try to catch inconsistencies in regulation: the one note where letoff is wrong, or other things that don’t feel right as I play the piano. Lubrication is standard: trapwork, key pins, keybed, damper wires, even music desk glides. Sometimes small adjustments need to be made to the fallboard, or the grand lid locking pin. This whole process repeats itself, at a smaller level, after the move to the customer’s home, and this is where the first warranty service comes into play (I don’t like to minimize it by calling it “the free tuning”). Issues can come up during the move, and environmental differences in the home can cause minor binding or alignment problems. We also get to make sure that the piano is positioned away from hazards like nearby heating vents. There’s a big difference in customer satisfaction if we catch a damper problem before sale and correct it, or if the buyer is annoyed by the problem in their home, and it’s not fixed until the first warranty service. Callbacks are a pain, and even though the same amount of work is done, and the problem is fixed, the buyer remembers the problem, and this affects the reputation of both the dealer and the manufacturer. (And it’s also cheaper to fix the problem on the showroom floor.) So most dealers I know work hard to prepare their inventory before sale. I don’t recommend that buyers pressure dealers to skip this work.